Have you lost control over lifting your hand? 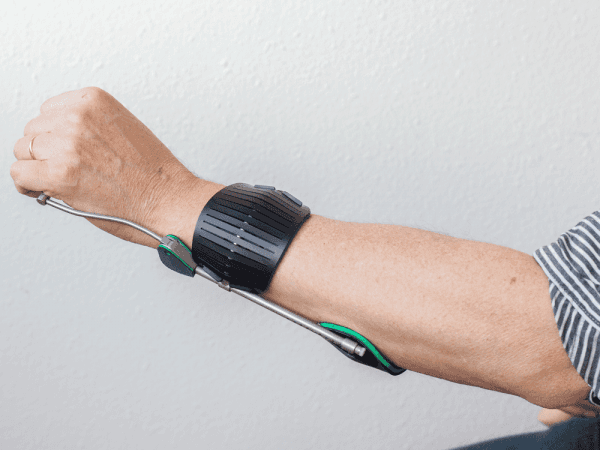 Do you have reduced strength in your wrist? Then you may not be able to lift your hand enough and use it properly: also called ‘wrist drop‘. For example this can be the effect of nerve damage to the arm due to a fracture or when the nerve is being pinched off too long, but also due to paralysis after a stroke. The Ambroise Dynamis Wrist Orthosis (ADWO) is a lightweight wrist orthosis (also known as wrist splint or wrist brace) that pushes the hand up dynamically with the aid of an adjustable spring. The orthosis is very comfortable because contact with the (palm of the) hand and arm is kept minimal. This way you get maximum function over your wrist and hand with minimal intervention. 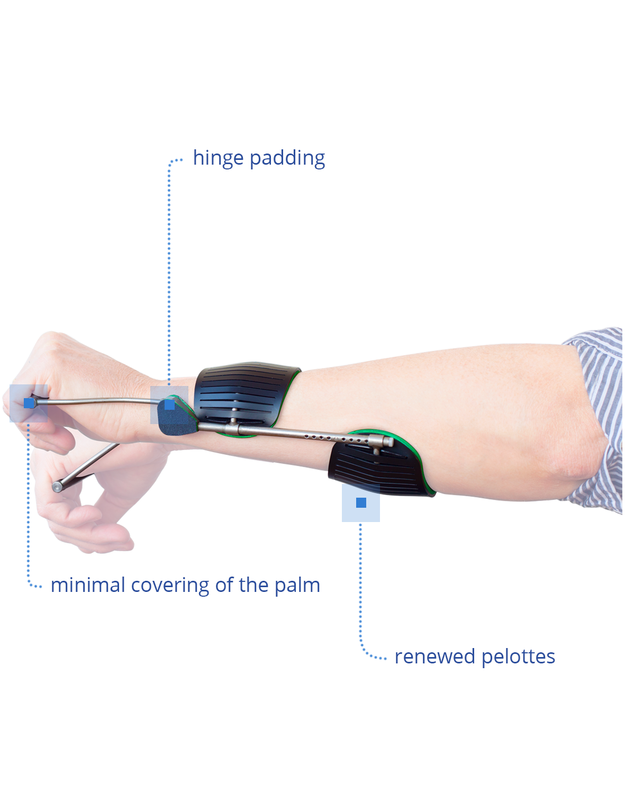 Active and dynamic support of the wrist. Minimal limitation of normal hand- and wrist mobility. Low weight (< 100 g). Minimal contact with the palm of the hand. Can be worn underneath clothing. Custom-made and therefore perfect fit. The hand is lifted with the aid of an adjustabel spring. Rance of motion: 45° palmair – 80° dorsal. Available in one size and in left or right version, which is custom made to fit the arm and hand. The ADWO is worn on the outside of the arm to leave the thumb free. Forearm circumference between 21 and 30 cm (thickest part of the forearm). Wrist circumference between 18 and 23 cm. Lifting the hand is also called dorsal flexion. Several muscles of the forearm are active (including the m. extensor digitorum en de m. extensor carpi radialis (longus and brevis)). The control of these muscles can be impaired by nerve damage (radial nerve). This can be the result of clamping that nerve or even nerve breakage for example due to a bone fracture such as a humerus fracture. The brains can also be responsible for the loss of control for example after suffering from a stoke (CVA). If you cannot make dorsal flexion with your hand anymore, in other words: you can not lift the hand, the hand hangs down. It becomes difficult to use the hand properly. This is also called ‘wrist drop’. This serious condition greatly reduces the functional possibilities of the hand, because only activities with the fingers primarily pointed downwards are still more or less possible. 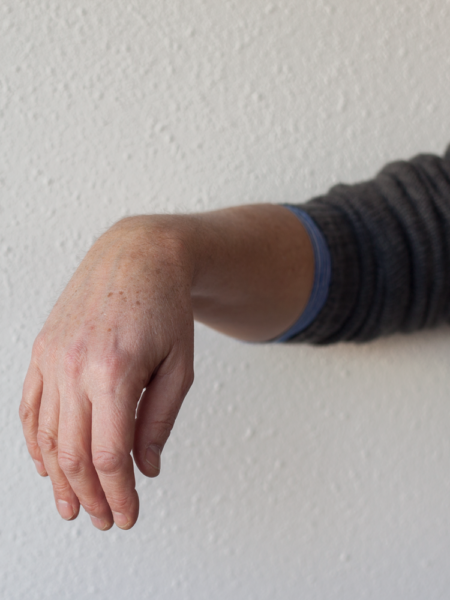 No longer being able to extend the hand, is also called wrist drop syndrome. The ADWO is easy to don. Put the forearm through the orthosis untill the the palm of the hand leans on the hand tube. The hand tube must lie in the middle of the hand fold. The ADWO can be cleaned with a damp cloth. The ADWO is generally worn for longer periods of time. Most users even wear it all day. Therefore, the orthosis must fit well and be properly adjusted to your hand and forearm. That’s why the ADWO is delivered as a custom fitted product. We can individually fit the orthosis for you, but also your local orthotist can help you. Do not leave your complaints untreated for too long. We may be able to increase the function of your hand with the ADWO. Our clinical experts will be happy to evaluate with you what the best solution is in your case. Contact us now to learn about the options to get an ADWO in your region. Your local orthotist and physiatrist can also indicate whether the ADWO is a viable option in the treatment of your situation. With the correct indication and your doctor’s reference, the ADWO will be reimbursed by all Dutch insurers. Please bear in mind that your local situation may differ. Do you want a non-binding advise from one of our clinical experts whether or not the ADWO could benefit you, or do you want to know which professionals in your area have experience with this orthosis? Feel free to contact us or call us today on +31 (0)53 430 28 36. We are happy to assist you. Especially, for people for whom an arm disorder is not congential, frustration can occur when daily activities can no longer be done. 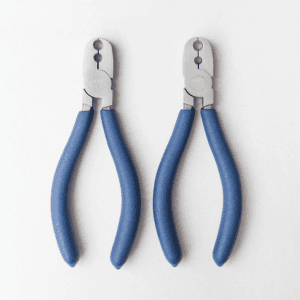 At Ambroise we try to restore maximum functionality of your hand with minimal resources. This is also the case with the Ambroise Dynamic Wrist Orthosis, the AWPO. 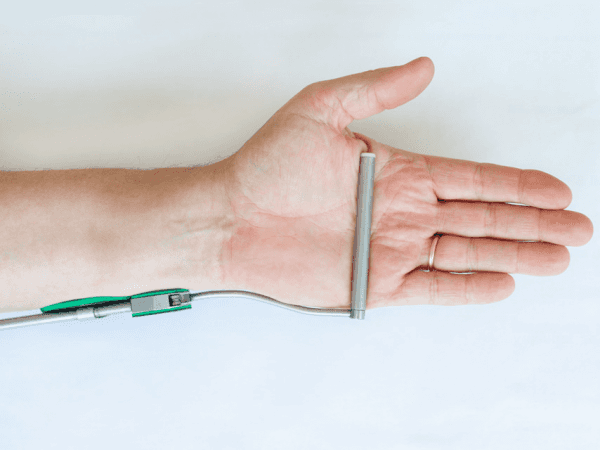 With the ADWO, the hand is supported on the hand palm side by a smooth thin tube which fits perfectly in the fold of the hand. This hand lever is lifted by an ingenious spring system, so that the hand follows. By adjusting the spring force, the ADWO lifts your hand and bend your wrist without too much effort. Thus, the wrist’s movement is restored and you can use your hand again. Minimal covering of the palm Only one thin smooth beam in the fold of the hand lifts the hand.